Urban landscape planning and design policies needed to facilitate independent mobility of children. Strategies for managing pedestrian and bicycle routes and the quality of the places of everyday life they connect—especially parks, but also museums, libraries, stores, social services, so that families are motivated to be outdoors engaged with the natural environment. The aim of the symposium is to stimulate discussion about how planners and designers can meet the challenge of enhancing the well-being of urban families in North Carolina, across the nation, and the world. As cities grow and develop, opportunities to support family life in a healthy public realm should multiply. European design innovations such as “home zones” together with community participation processes and design guidelines will serve as triggers for discussions about how cities can grow in harmony with the needs of their citizens across the life span. Robin Moore, Dipl. Arch, MCP, Hon.ASLA, Director, Natural Learning Initiative NC State University, Raleigh, NC. 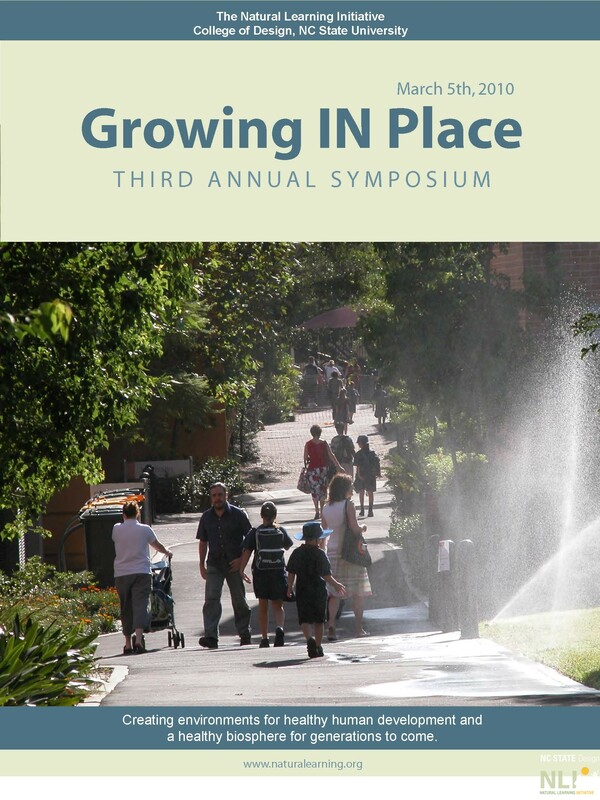 Why Growing In Place? The new imperative: Intentional design for children’s access to diversity and independent mobility at neighborhood level. Balancing new parameters: housing form, housing density, limiting the private automobile, non-motorized travel, and space for diverse nature. Tim Beatley, PhD & Teresa Heinz Professor of Sustainable Communities School of Architecture, University of Virginia, Charlottesville, VA. Case examples of child and family sustainable development from Europe and elsewhere. Measures of success. What can we learn from international practice. Cynthia Hoyle, AICP Transportation Planning Consultant Champaign-Urbana Mass Transit District, IL. Designing mixed use, child-friendly streets. Changing traditional traffic engineering concepts and practice. Retrofitting urban neighborhood streets. Case examples. Joseph ‘Joe’ Wynns, MS, CPRP Director Emeritus Indiana Department of Parks and Recreation, Indianapolis, IN. New policies for urban play. Supporting urban childhood through innovative parks and recreation programming. US case examples. Steve Nygren Co-founder of Serenbe, GA. New, sustainable models for dense urban forms that support children’s health, independent mobility and social development, while conserving the natural environment. The Serenbe story.